Apply for a Federal Work-Study Job in the Financial Aid Office. Visit Central Piedmont’s Human Resources website at edu/humanresources and click on “Careers at CPCC” on the left side of the page. Contact Jordan Daito, Federal Work-Study program coordinator, for Central Piedmont at 704.330.2722, ext. 3944 or at jordon.dalto@cpcc.edu. The Bookstore is Now Hiring! Barnes & Noble College is a retail environment like no other – uniquely focused on delivering outstanding customer service. As a temporary bookseller, you interact directly with students, faculty, administration and other customers on a day-to-day basis, turning visitors into loyal customers. You’ll be part of a team that’s passionate about what they do, providing outstanding customer service and ensuring that all customers’ needs are being met. You perform an array of tasks necessary to ensure that merchandise is available for sale and that transactions are completed accurately and promptly. You play an important role in ensuring that we operate a customer-oriented, efficient, cost-controlled, well-merchandised, and profitable bookstore that best serves the academic community and Barnes & Noble College. And best of all, you’ll be part of a company that is consistently rated as a great place to work – and where employees love what they do. Candidates must be a minimum of 16 years of age to be considered for employment. Outstanding communication and customer service skills are required. The ideal candidate will have the ability to multi-task and feel comfortable utilizing computers. Candidates must be flexible with scheduling work days and hours. Get Ready for the CPCC Career Fair on Thursday, March 9! Are you getting ready to graduate and need to find a full-time job? Thinking about a part-time job for the summer? Just curious about what a career fair might be like? If you answered yes to any of the above questions, then make time to come to the CPCC Career Fair on Thursday, March 9, from 11 a.m. to 2 p.m. It will be hosted by Career Services in the Worrell Gym on Central Campus, and will feature more than 60 employers who are all currently hiring! Now is the time to begin researching employers and make sure your resume is career fair-ready. Don’t have a resume yet? No problem! Stop by Career Services Drop-In Hours: Central Campus – Wednesdays from 11 a.m.-1 p.m. in CH122; Levine Campus – Tuesdays from noon-2 p.m. in LV1408. You can also make an appointment with a career counselor: www.cpcc.edu/career/contact-us. Are You Ready for the CPCC Career Fair? 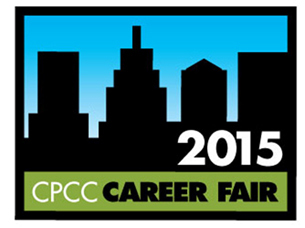 Mark your calendar for Thursday March 5, 10 a.m. to 2:30 p.m for the CPCC Career Fair. More than 95 companies will be at the Grady Cole Center to discuss full-time, part-time and internship opportunities. What should you be doing now to get ready for next month’s job searching event? Schedule a 30-minute resume appointment with a career counselor at your campus. Email your resume to a career counselor for suggested edits. Stop by Central Campus Drop-In Hours, every Wednesday 11 a.m.-1 p.m. (no appointment necessary). Bring a printed copy of your resume with you. Get your professional attire ready. Professional dress is required for admission to the event. Dress to impress the employers. Visit the Career Services Pinterest board for tips on what to wear. Research companies attending the career fair. Use the link listing attending employers to learn which companies are recruiting for your program. Research the companies you want to talk to. Apply now through EmploymeNC to the jobs they’re recruiting for. This shows the recruiters your interest! Practice your pitch outlining what you’ll say to employers at the fair. Be sure to visit the Career Services career fair tips page for additional resources. Career Services will host more than 80 employers at the 2013 Career Fair on Thursday, March 7, from 10 a.m. to 2:30 p.m. at the Grady Cole Center. More than 20 new companies have registered in the past week! See the list of what companies are signed up here. Whether you’re graduating in May and looking for something full-time in your field or looking for something part-time while you attend classes, the Career Fair is a great way to get new job leads. Why Attend the Career Fair? Every company coming to the fair is hiring. Standing out from the crowd can be difficult when you’re applying for jobs online – the Career Fair gives you a chance to make a great impression in-person. Even if you’re not looking for a job, meeting employers and making connections will pay off in the future. Prepare early by visiting Career Services: Contact our Central campus office at 704.330.6551, CH 365 or view contact information for Career Services at other campuses. Create a professional resume and a get a professional resume review. Follow the Career Services Blog for advice. Bring your CPCC Student ID to skip long lines and be admitted at the student entrance. The CPCC Career Fair is open to anyone who is looking for a job; please tell your friends and family! Visit http://www.cpcc.edu/career/studentsgrads/career-fair for more event info and tips to prepare.